As with any form of business, it’s just as important to advertise to your realty business. Advertising has become easier than ever, thanks to the internet and social media. Print ads are still relevant, but keeping an online presence allows you to reach more clients quickly and easily. In 2016, there are more than 3 billion internet users, so you can’t afford to ignore online advertising. In this article, we’ll discuss how you can utilize the internet as a realtor to get more leads. Keep reading! Establish a personal blog where you can post updates on the best property locations, give advice to clients and list housing prices in localities that you deal with. Many users nowadays prefer to browse the internet via their smartphones and tablets, so make sure the blog is compatible to operating systems such as Android and iOS. You can also ask people to subscribe to you, by adding a button on your blog. More on subscribers next! Newsletters are a great way to reach out to those who’ve subscribed to your blog. You can give them weekly updates about market trends, the best places to find property, things to look out for when searching and other advice to help them out in their search. Getting subscribers is a tricky task, as you need to create enough interest among clients to subscribe to you. One suggestion is to introduce premium content, which is only available to people who subscribe to your newsletter by providing their email address. If you think it’s a difficult task, hire someone within the field to help run the blog, and do write ups for you. Websites like Scripted and Contently are useful in this aspect. Most people will begin their home search on Google, so step one is to ensure you’re at the top of searches, or at least on the first page. Do this by finding out what your audience is searching. This is where Google Adwords come in handy. The Google search engine works by comparing your ad to the search term - that’s why you tend to see fast food ads if you Google tacos. Google has personalized search too, and refines its searches to different users based on their previous searches. Check out this article to find more about Google Adwords and how it can help you get leads. Running Adword Campaigns will help you out pinpoint your targeting audiences, and with a good Adwords campaign, you’ll be making multiple similar ads (the differences will be in keywords used). This is a universal tip, for any realtor, business owner or freelancer. At some point, you’ll need to work out a collaboration with others who share similar interests. One common tactic used by realtors is getting guest writers from other blogs to write for them. Similarly, you can work as a guest writer for other blogs. This method is effective, because it allows you to get leads from channels other than yours, which can ultimately lead them to your own blog. Facebook is a great place to start looking for leads, but it’s no easy task, because potential clients won’t just flock to your page. You’ll need to earn their attention, by producing interesting or viral content on your page. There is no easy formula to producing quality content. Really, it requires a lot of trial and error to understand what your audience like best. The best approach is to produce content that’s generally useful and interesting to clients. Realtors(™) do a great job in recognizing what their audience want from them, and provide it. You’ll also need to experiment on the times when you should be posting content. Untimely posts will result in less responses than the post’s potential. Consider boosting your posts too, to get leads faster. Simply put, you pay Facebook a fee, and in return, your post will appear higher up on your audience’s newsfeed, and it will also appear in newsfeeds of more people. 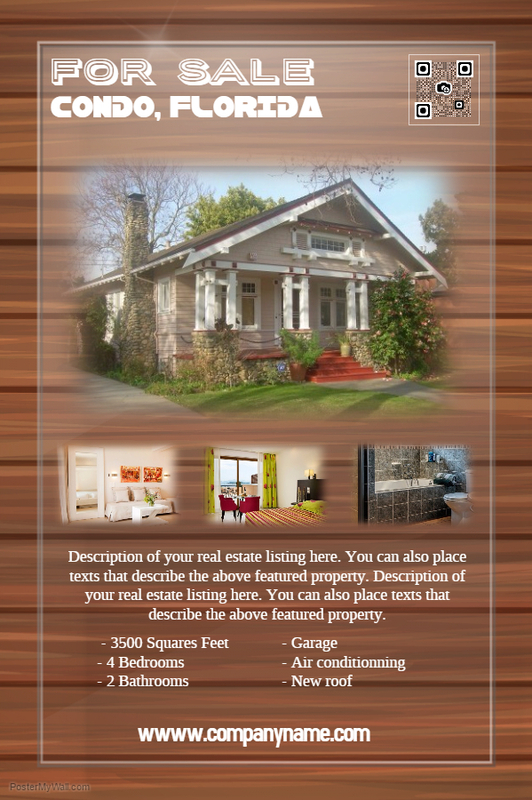 Flyers and Posters, whether you present them online or offline to advertise property, is crucial for any realtor. PosterMyWall offers you the chance to create high quality visual content in the form of posters, banners, even social media content, all for free! Use real estate templates, designed by our community of professional designers, to make the task of designing even easier. On our blog, you’ll find more marketing tips, and latest features we’ve added to the Poster Maker. Here are some samples taken from our website, designed by our awesome design community. Let’s get started by making high quality visual content for your Facebook page and blog! Check out PosterMyWall and take a tour to familiarize yourself with the various tools at your disposal to make the visual content you require. We’re also on Twitter, Pinterest and Instagram. Aug 11 Food fights and tomatoes - It's La Tomatina! Jul 29 6 Marketing Tips to Attract Customers to your Bar!